Edit - the map below no longer works. Try FlightRadar24 instead for live tracking of airplanes around the world. We have seen real-time tracking of trains and boats on Google Maps, so I guess it was only a matter of time before we saw real-time tracking of a helicopter on Google Maps. AirFox Live is not just any old helicopter either, but a helicopter with a TV crew aboard! So you can watch live video, shot from AirFox's helicopter, at the same time as following the journey on Google Maps. How cool is that? AirFox flies out of Schaumburg Regional Airport, in Schaumburg Illinois. Every morning, pilot Kimberly, photographer Matt, and traffic anchor Sondra Solarte take off around 5:25 and are in the air for three hours. So if you drop into AirFox's website any time between 5:30am and 8:30am Central Time you can follow all the action as it happens. If you log on at any other time you can watch a live 'skyline' web cam instead. I know tomorrow morning I'll be watching live! Update: Google has now made the shockingly bad move of removing the Wikipedia layer from Google Maps. 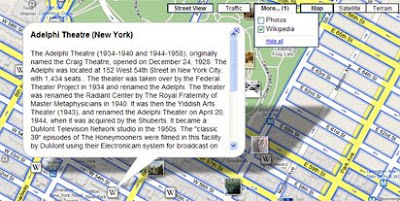 However there are still some third party maps that can help you find Wikipedia information on a Google Map. I've linked to some of the more useful maps in this Google Kills Wikipedia post. In what is proving to be another busy day for Google, Wikipedia articles have been added to Google Maps. The new Wikipedia tags can be turned on via a 'More' button that has been added to the top right hand corner of the map. When the Wikipedia tick box is selected small 'W' tags appear on the map where Wikipedia articles are available. Clicking on the 'W' tag will open an information window containing the Wikipedia article. Panoramio photos can also be turned on via the same 'More' button. The photos option however feels a little superfluous considering Panoramio photos were added last week and can also be turned on in the left-hand panel. Intriguingly the photos turned on by the 'More' button contain a Panoramio logo whilst the ones accessed by the left-hand side panel don't, even though both sets of photos are served by Panoramio.